Colostrum is a special immune-active fluid secreted by a female cow for about three days after giving birth. 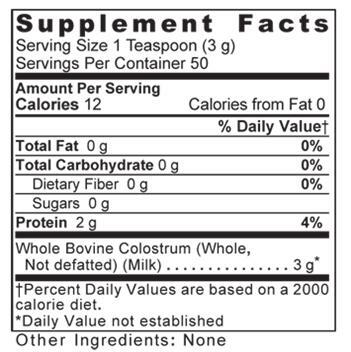 Colostrum-21™ is made from 100% whole bovine colostrum that is not defatted and pesticide-free. Colostrum-21™ contains a minimum of 21% immunoglobulins (IgG) (634 mg/tsp, 74 mg/cap) for effective immune support. In addition, this concentrate delivers a full-spectrum of multiple immune support agents including lactoferrin (21.4 mg/tsp, 2.5 mg/cap), N-acetylneurominic acid (103 mg/tsp, 12 mg/cap) and IGF-I (6,429 ng/tsp, 750 ng/cap) [typical amounts]. Take 1 teaspoon, 2 times daily mixed in food or drinks. For special programs recommended by your practitioner, up to 4 individual servings may be taken daily (1 serving = 1 teaspoon). Please refrigerate after opening.